King Ranch Chicken has been around for years! This Slow Cooker version can be put together in just a matter of minutes and tastes delicious. A layered tortilla chips, chicken, and creamy soup mixture make this comfort food hard to beat. We can’t begin to tell you how much we love using our slow cookers. It’s so nice to throw all the ingredients in your slow cooker and have no dinner worries for the rest of the day! 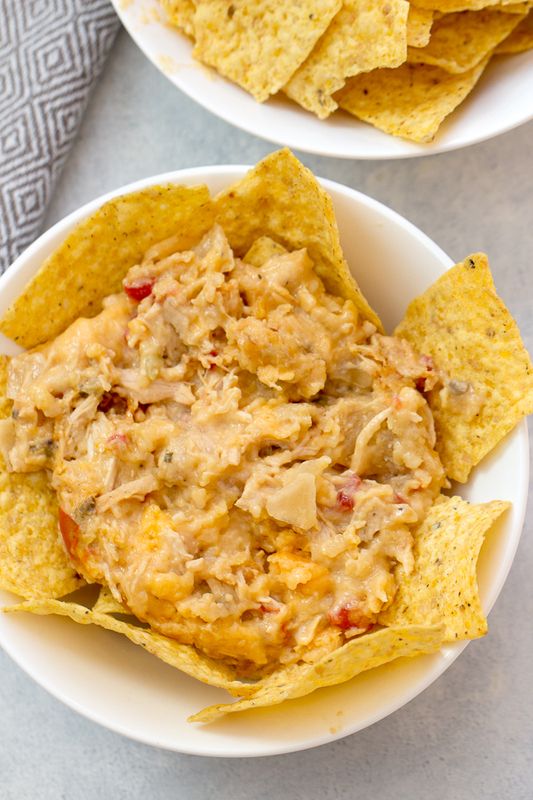 Your family will go crazy over this King Ranch Chicken recipe with chicken, cheese, and tortilla chips. It’s so delicious! No one is exactly sure why it’s called King Ranch Chicken, but this Tex-Mex recipe has been around for years! It’s rumored that its name comes from King Ranch, one of the largest ranches in the United States, although no one has actually found a connection between the dish and the ranch. It may be a mystery, but this chicken dish has been a favorite in Texas cookbooks and lunchrooms for a long time. Ready to have dinner done in just a matter of minutes? 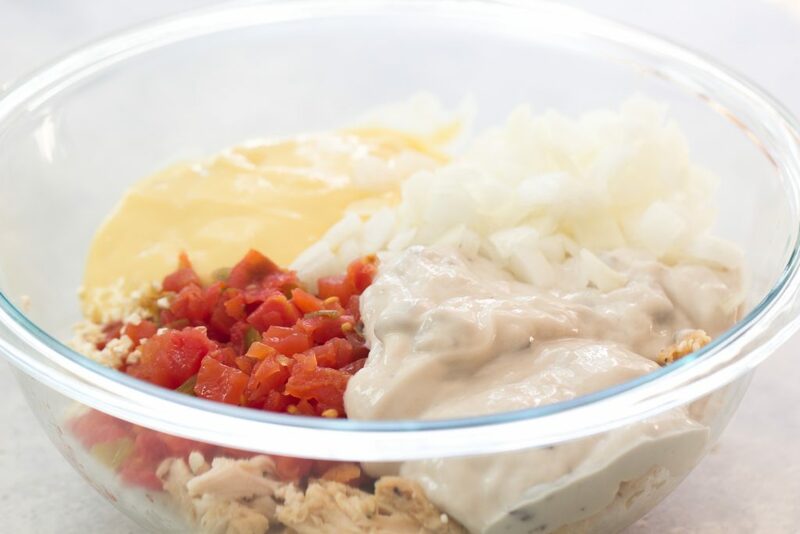 Here are the step by step instructions on making King Ranch Chicken in your slow cooker. Spread a layer of tortilla chips in the crock pot to cover the bottom. It’s ok if they are overlapping. In a medium sized bowl combine the chicken, diced tomatoes, cream of chicken soup, cream of mushroom soup, chicken broth, garlic and onion. This looks so yummy and I LOVE crock pot recipes!! Do you have to cook the chicken before you put it all together and then cook for 6 hours in the crock pot?? Jen, I was astounded by this as well! Glad to know I wasn't the only one. Putting already cooked chicken in the crockpot for 4-6 hours sounded like the results would be a dish with chicken the consistency of leather in it. I'm going to try it though because overall it sounds easy and tasty. @Jen Yes, the recipe states "cooked & diced"
I was wondering about the chicken too since it seems like a lot of time in the crock pot due to the fact that the chicken is already cooked. I'm sure the others just wanted to clarify as well. This sounds amazing and I can't wait to try it!! I have cooked this for years. I stew a whole chicken, then use half of the chicken stripped from the bone and freeze the other half for another recipe or double this. I don't like too much of the soup so I use one can cream of mushroom chicken. And, rather than tortilla chips, I use corn chips. I might add that you can buy slow cooker casserole's now. An hour is enough to cook this. Thank you for the nice recipe and have a wonderful day. I think you posted some time last year. How did it go with the raw chicken? I also wondered why cook chicken then put in crockpot for 6 hours. Has anyone tried to make this with raw chicken? I have. It worked out great. Just made this for dinner tonight and it was yummy! I cheated by buying a bag of frozen grilled chicken strips, putting them in the fridge overnight to thaw and then just chopping them up for the recipe. I loved how easy this was. I wonder, could I assemble this and bake it? You could bake it. Your chips will not be as soft. But that doesn't really change the taste of the dish. Just watch it closely. We have only made it in the slow cooker. I have a recipe that is a baked King Ranch, and instead of tortilla chips, you just just tortillas! You just tear them up when you are layering!! 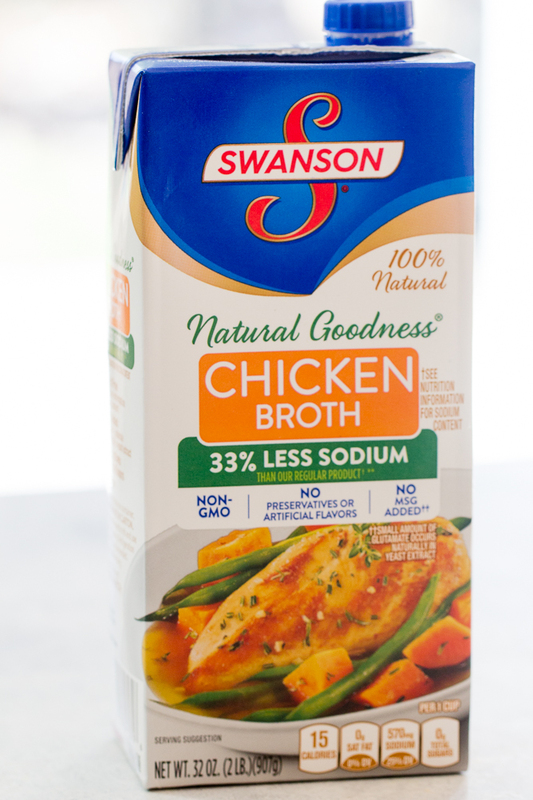 The Directions include mixing in the Chicken Broth, but broth isn't listed in the ingredients - how much should be used? I just made this recipe- had it cooking on low and only lasted 5 hours before I decided it had to be done. Everything had turned to mush and it had no taste. Are you really supposed to cook it for 6 hours? I feel like after a couple hours at the most it looked like your picture. The tortilla chips will soften as they cook. The recipes says to serve with extra tortilla chips too. We liked the soft chips, similar to a casserole. Crock pots also vary slightly with temps and we have found the older they get the more off they are temperature wise. So 5 hours may have been enough with your crock pot. Thanks so much for stopping by SixSistersStuff.com. Have a terrific weekend. I make recipe like this in a casserole! It's sooooo yummy. I add it corn, cumin and paprika to mine. My sister ate 4 helping! I'm sorry. Maybe I missed something, but this was just not that good! I was excited to check out this recipe but I was put off by the whole "cooked chicken" thing. I just don't see the point in using a slow cooker for 6 hours if I have to start off with already cooked chicken. I thought the same thing! What is the point in pre-cooking the chicken if you're going to put it in the crock pot for six hours? And if you have to cook and dice the chicken first, then it's definitely not a throw-all-the-ingredients-in-your-crock-pot-and-go kind of recipe. Too much prep and you lose the whole point in using your crock pot. Looks yummy, but I don't think I'll ever get around to trying it. I used raw chicken. I guess it worked okay. The biggest problems were that the chips turned to mush and my (raw) chicken was way over cooked and it was so salty and just generally gross. Can you make it w/out the chips? Yes, it will be fine without the chips! ah thank you! i know this is super late but I've been looking to see if subbing torn up corn tortillas are okay instead of the chips. You'd be surprised how hard it is to get that one detail. 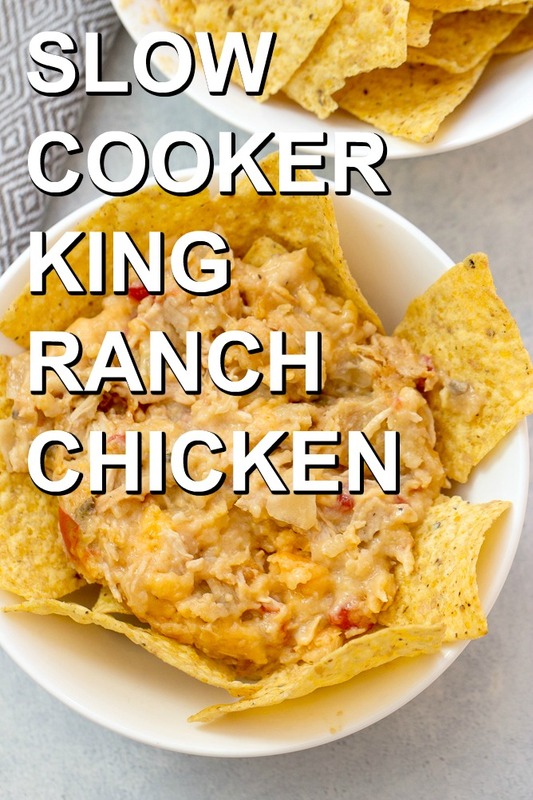 I want to try King ranch chicken in my crock pot. I too ended up with complete mush, with very little flavor despite my seasoning the chicken before I cooked it. I have had zero success using the crock pot and my husband is threatening to throw it out! As a FT working mom, I'm desperate for some tasty meals to come out of the damn thing! Not sure if you will read this reply but i have awesome awesome crock pot recipes. A great beef stew, spaghetti and meatballs, teriyaki meatballs, tomato parmesan soup.....i didn't have success with this particular recipe either, but definitely don't throw out the crock pot! Try a beef stew or pot roast. They come out great and McCormick makes packaged mixes especially for slow cookers/crock pots. Hi everyone! This is actually a very popular dish that I make very often, it is one of my favorite foods. The only shock to me is that you can make it in a slow cooker! I have always made it as a casserole. To make it in the oven you preheat it to 350 degrees and bake it for 20-25 minutes, with the chicken being previously boiled on the stove top until it is done. This always tastes way better if you use Doritos instead of regular Tortilla chips also. I will have to try to make it in the slow cooker to see if it works. I am going to use raw chicken cut into cubes though. The chips that are in the crock pot soften with the cooking. We add more at the end. So sorry it didn't work out for you. We have never had a problem with this recipe and we have it all the time. Its the juices from cooking the raw chicken, that why we use cooked chicken, try with using left over rotisserie chicken, i think you will be surprised. We have this all the time! It's perfect for cooking in my motor home while we're traveling, then we have a meal ready when we stop. I use raw chicken cut in small chunks and it comes out great. I also use tortillas torn into a few strips instead of chips, and no chicken broth. Maybe the broth is what makes it "mush" as other reviewers noted. I like the flavors of this recipe, but the chips were just either burned to the side of the crock pot or useless mush. I would rather just skip the chips and serve yummy crunchy chips at the table. Treat is more as a nachos-style dip. Still yummy though! I make this in a casserole in the oven as well. I will definitely try to make in the crock pot. We prefer yellow corn tortillas torn up so you do not get mushy salty chip taste like ^ previous commenters were talking about. Also, the broth could be what is making it mushy since I don't use broth to make this recipe. It depends on if you want it more of a dip or an actual meal I guess. I have always eaten it as a casserole. Also, remember that times vary due to the size of the crockpot and each one is different. Crockpots are kind of a trial and error thing if you cannot be there to watch it and test the timing with a new recipe especially one that has a few different ways of making it. We made this today for a church pot luck and it was gone super quick!! Everyone loved it!! I really can't wait to try this. I have only had it backed in the oven, so this will be a good change. This looked so yummy I just had to try it. It is in the crockpot now for dinner tonight. I did add some cumin and sprinkled some fresh cilantro between the layers. It's been on for a couple of hours and already smells amazing! Going to serve it with Mexican/Spanish style rice and a nice green salad with my homemade Honey Cilantro Lime dressing. I have sour cream, green onion, cilantro and salsa on hand to serve with it as well. Thanks so much! Our family loves this recipe. I'm making it with precooked hamburger tomorrow. Hope it turns out as well as the chicken. I am going to use this as a base and just cook it on the stove, then layer it and pop it in the oven at 350 for like 30 minutes. Sounds yummy! So it is King ranch chicken without ranch in it? I saw another recipe that has ranch in it. Did we forget the ranch or just in the name? King Ranch is the largest ranch in Texas. Has nothing to do with ranch dressing. King Ranch is actually a ranch! This recipe is not named after ranch flavoring. This was awesome and was a huge hit!! I used Clancey's Green Chile and Qeueso tortilla chips from Aldi's, which added even more flavor! Does any one know the nutritional information on this? It's sounds like it would be good but also not so healthy either. Click on the MAGIC button under the picture on the blog post. Then click on NUTRITION in the upper left hand side and it will give you all of the nutritional information on this recipe. How many does his serve? It looks great! Oh, I see that on the recipe now. Thanks! I make this all the time. However, I use raw chicken and do not put chips in. When it is done cooking, I put chips in a bowl and put king ranch mixture and shredded cheese on top. I cook for abt 6hrs on low. It was tasty. We liked it. But this is probably the 4th different recipe of King Ranch I have made. Short of getting an Abuela to make fresh corn tortillas for it, they turn to mush and dissolve in to the casserole. I have tried dipping them in to hot oil like when you make Enchiladas, I have use corn chips, and Tostada shells. They all dissolve. Any one have and suggestions? I have made this recipe for years, and we all LOVE it! I'm actually in Texas, close to the actual King ranch, so I've had many, many versions of King Ranch casserole. This recipe is the one that I return to time and again for my family, and for potlucks. If you don't want your tortillas mushy, there are several options. You can use real corn tortillas and layer as you would in a baking dish, or use hearty/thick tortilla chips. Also, cut down your cooking time. I prefer to use the thick, restaurant style tortilla chips. It's just easy and quick! If you use Doritos, (such as Nacho cheese flavor), it changes the flavor of the dish (still good, but not the true flavors of King Ranch casserole). I only have to cook in my slow cooker for a about 3 hours, because the chicken is only getting heated through, not actually cooked. 2-3 hours is long enough to heat through, melt your cheese, and soften your tortillas. When I take it to work, I throw all the ingredients into the crock pot, and plug it in no later than 9 AM. It's perfect for our noon luncheon. 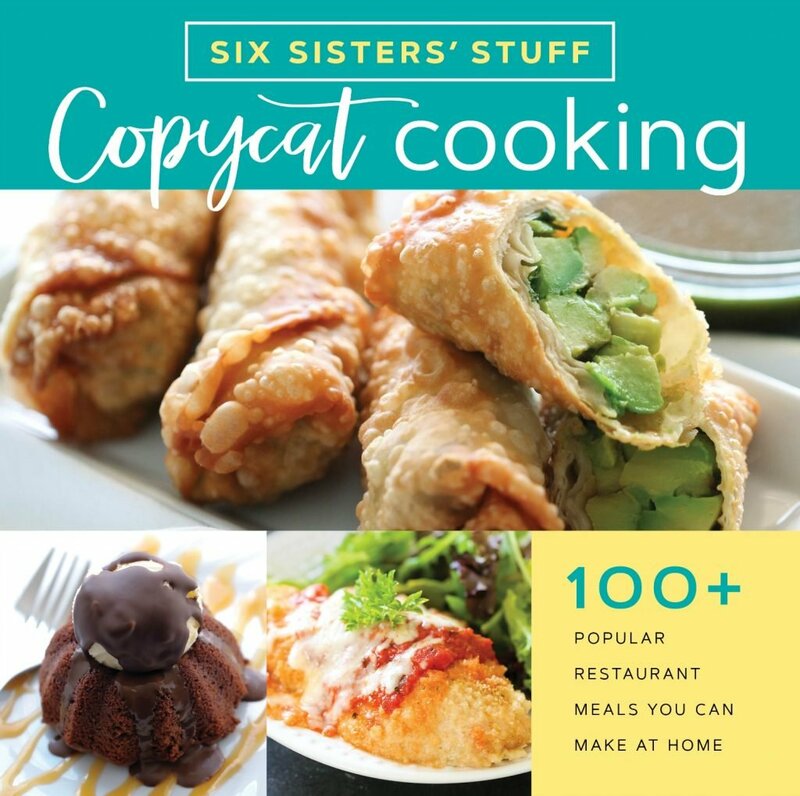 Thank you Six Sisters for this "keeper", that has become one of my most requested recipes! Hi Tina, We are so glad that you like the easy Slow Cooker King Ranch Chicken. Thanks for some great tips on this recipe.